FREMONT, Calif., Feb. 5, 2019 /PRNewswire/ -- Bay Materials LLC, the industry leader in high performance thermoformable materials for orthodontic clear aligner therapy, today announced the commercial release of a 1mm (0.040") thick version of its highly regarded Zendura plastic sheet material. Lab tests demonstrate that this 1mm thick Zendura (p/n 9169) is the most crack resistant and overall durable material commercially available for orthodontic applications like post-treatment retainers, as well as nightguards, bite guards, and special positioning appliances. 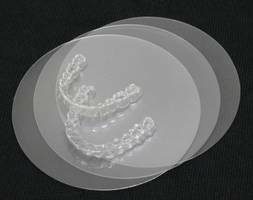 Zendura #9169 is also ideal for retainers and nightguards for patients who are heavy bruxers. Engineered by a team of world-class material scientists to provide the optimum balance of stress retention, durability, elasticity, clarity, and stain resistance necessary to provide a superior-performing retainer or specialty appliance, Zendura is made from a proprietary, medical-grade polyurethane (TPU) resin and is the only commercially available polyurethane material engineered for orthodontic and dental applications. Virtually all patients who have undergone orthodontic therapy, whether via standard bracket and wire treatment or clear aligner therapy (CAT), require a post-therapy retainer to assure the teeth will remain in their final position. Many clinicians find that patients' teeth can be reliably retained with a thermoformed appliance, very frequently worn only during sleep time. "The commercial release of this 1mm thick version of Zendura is an important addition to our product line and demonstrates our commitment to providing our orthodontic and dental customers with a wide range of innovative plastic sheet material options to help them advance the art and science of orthodontic treatment," said Ray Stewart, PhD, founder and CEO of Bay Materials. "The global trend of beauty and esthetics and shorter treatment times continues to have a profound effect on patients' orthodontic treatment preferences, and Zendura Dental is committed to helping clinicians better address this with our unique and exceptionally effective and durable thermoplastic materials." Zendura p/n 9169 is available for purchase directly from Bay Materials' Zendura web store (www.zenduradental.com) or by calling 1-650-566-0800. Bay Materials, founded in 2000, is a Silicon Valley-based polymer materials company engaged in manufacturing and marketing advanced materials for the orthodontic industry. Its Zendura brand of material is widely regarded as the best commercially available clear thermoplastic material for fabricating orthodontic clear aligners and post-treatment retainers. Bay Materials also provides materials-intensive product development services for select companies. For more information on Bay Materials, visit the Bay Materials website at www.baymaterials.com. For more information on Zendura products, visit the Zendura Dental website at www.zenduradental.com.